If you have invested in higher quality kitchen tools mind you, we would recommend that you opt for a different manual sharpener to this. 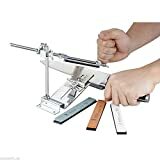 The course carbide blades (used for sharpening) and fine grade ceramic rods (used for honing) are at pre-set angles within the unit, providing accurate sharpening for anyone using it, no matter their experience. As is standard for small handheld sharpeners such as this, the unit comes with non-slip rubber feet and a soft grip rubber handle for you to hold everything steady while you sharpen. It is difficult to find fault with the IQ Edge Grip, at such a low price it certainly will sharpen your knives with ease. However, without being particular, we here at Sharpen-up would not want to use a sharpener of this quality on the knives that we own. As we have already stated. The carbide blades do take a lot off the blade, and it just isn’t suitable for higher quality knives, or serrated knives. 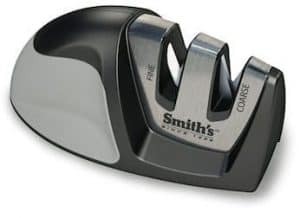 If you are looking for a affordable way to sharpen your standard straight edged kitchen knives however, there are definitely worse sharpeners to buy than this. 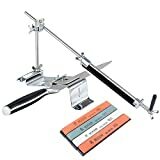 The pre-set angles allow for correct sharpening no matter the user.